You are here: Home / Note Brokers / How Do I Find Notes For A Sale On A Budget? 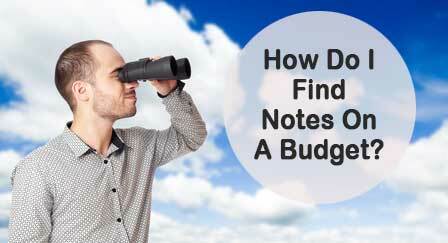 Wondering how to find real estate notes for sale on a budget? You are not alone. Here are some helpful tips in answer to a common note broker question. I previously owned a mortgage broker business and in 2007 did dabble in the note business. I also closed about 4-5 deals as a note broker. I have since closed my mortgage broker business and would like to get into note brokering, but I have a limited budget to start with (about $2000 – $3000). I purchased your program for support and to acquire additional knowledge. How do you suggest I spend my limited funds to get started? You ask a great question and actually have a decent marketing budget to get started. While there are people in this business buying notes that don’t have a website, I truly believe you need at least a basic 5 to 7 page Note Buyer website to be in business these days. Think of the site as your storefront, providing credibility for your services. All of these setup items can usually be accomplished with under a $500 budget. The least expensive way to market is by building a referral base. This can be done through networking with other professionals, offering local trainings, and Reverse Ad Marketing for the note business. Great networking candidates are real estate professionals, agents, CPAs, real estate attorneys, mortgage brokers, and real estate investment clubs. Referral marketing takes your time rather than your dollars and will utilize your business cards, brochures, and website from the setup process. Run the free ads available online with sites like Craigslist, Ebay classifieds, and other online directories. Avoid buying classified ads or expensive display ads. Print ads rarely payoff unless you use a local want ad type paper (Nickel Nick, Penny Saver, etc) that offers low rates and you live in one of the high volume states for seller financing. Look at a small but consistent direct mail campaign to note holders in your area. To save funds build the list yourself or purchase from a list provider like Advanced Seller Data Services. In order to maximize efforts, prequalify the notes for basic things like approximate equity (20% or more for best results) and property type (SFR). This will save you from paying postage to mail letters or postcards on deals that are harder to place with a note buyer. The best way to stretch a small note broker marketing budget is to think local. Work on branding yourself as the local seller financed note specialist. As funds become available then expand your efforts into other areas. You’ll find the “How To” details including sample scripts, brochures, and marketing pieces for each method in your member’s area of the Finding Cash Flow Notes training. Hope that helps and feel free to contact me with additional questions. Have sold some notes already. Need help on FINDING those notes secured by real estate that want to sell. A lot is being said about finding notes. When you find a yourself and dont want to purchase the note, do you usee a purchase contract? Then assign it . Do you let the investor use his purchase contract, while you collect most documents? Just curious how an experienced company as yours proceeds to purchase. Most investors will start due diligence with your initial agreement and then will want their own agreement signed by the seller at closing. We provide a sample purchase agreement in the member’s area of FindingCashFlowNotes.com. which is fairly industry standard. However all investors have their own preferences when it comes time to issue the closing documents. Their preferred agreement will be part of the transfer package (assignment, note endorsement, purchase agreement, hello letter, etc). A few investors might demand their agreement signed upfront rather than accepting yours. This just has to be dealt with on a case by case basis. Just be careful to protect yourself by getting an assignment fee contract or some other commitment letter from the investor. Once a quote has been verbally accepted by the seller you can simply ask the investor before sending out the initial agreement until you get a good feel on how each investor handles.